Well I finally have an new image to share. I have experienced some technical difficulties (my NEW laptop had a system crash) and flaky weather has been a problem, but I managed to get this galaxy imaged and processed. So you are asking yourself, "what is the deal with those funky names for galaxies and such"? Well, the "M" stands Messier... Charles Messier. Who the heck is that? Well ol' Chuck was an 18th century French astronomer who really dug comets. I mean this guy just looked and looked for comets. Sometimes he would find a bright fuzzy object in his telescope and get all excited, then he would would discover it was NOT a comet and get all pissed off, record its position, and give it a number -- that way nobody would be fooled again! After a while he had a whole catalogue of "not comets". This catalogue is now refered to as the Messier Catalogue of objects and contains some of the best and brightest deepsky objects (nebulae, galaxies, star clusters). 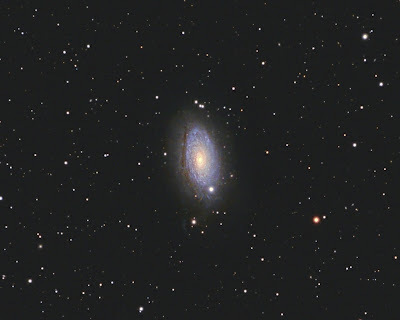 So here is my image of the "not comet" M63 -- a beautiful galaxy (also known as the Sunflower Galaxy). 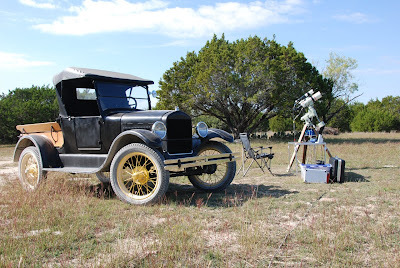 Last October I was at the ranch doing my usual "dark of the moon" imaging run, when this old Model T pulled up next to my FSQ imaging rig. The Model T belongs to a real interesting fellow named Gale O'Keefe. Gale is an elderly gent (in his 80's) who lives on a nearby ranch with a dog, named "dog". Gale is something of an inventor and a real sharp dude. He used to restore old Model T cars when he was a kid and hit the old farm roads, going hunting and fishing with his brother. Well, Gale found this rusting old Model T truck in a pasture where it had sat for decades. When he contacted the rancher about it, the guy told Gale he could have it if he would haul it off. So Gale brought it home and began restoring it, just like when he was a kid (more than 60 years ago). His goal was to finish it and get it running in time for his brother's visit so they could go riding the country roads in a Model T like they did when they were kids. Gale finished in time and the two brothers had their ride. So when Gale parked the old Model T next to my new FSQ telescope, I was struck by the contrast -- both beautiful designs, state-of-the-art in their own time. Somehow they fit well together, so I took this photo. This is Abel 779 -- a galaxy cluster of dozens of "Island Universes" in the Lynx constellation. 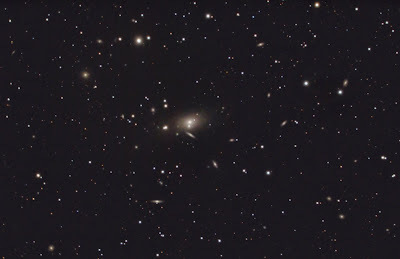 The bright fuzzy galaxy in the center is NGC 2832. The concept of other galaxies, like our Milky Way, is relatively new. In fact, until 1929 astronomers thought these faint fuzzy objects were nebulae located right here in our own Milky Way. But Hubble (the man, not the telescope) proved that the stars in the Andromeda "nebula" were actually FAR outside of our galaxy -- Andromeda was another galaxy, like ours! Until this time, it was thought the Milky Way WAS the universe. Suddenly, overnight, the universe grew to immense proportions and other galaxies ("Island Universes") began popping up everywhere. Our Milky Way went from being the universe to being just one tiny minor part of a much bigger picture! 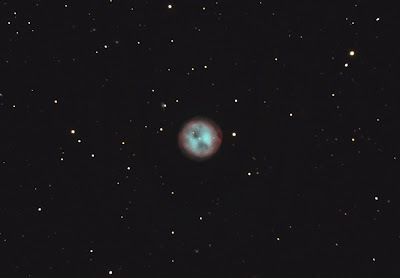 Here is my shot of the Owl Nebula, taken at Rancho Venado last month. This nebula is called a "Planetary Nebula", although it has nothing to do with planets (except it is round like one). 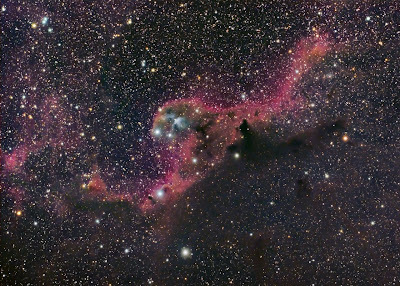 These types of nebulae are the products of dying stars. As the star uses up its fuel, it loses mass and begins to collapse, ejecting material into space (in this photo, all of the material is emanating from the tiny star in the center of the Owl). But the death is not sad. Like everything else in the universe, new life springs from death (the ol' circle of life thang). The ejected material will eventually join more material, group together by gravitational attraction, heat up, and create a new star -- an endless cycle. Here is an interesting field around Barnard 30, a star forming region just north of Orion's "head". 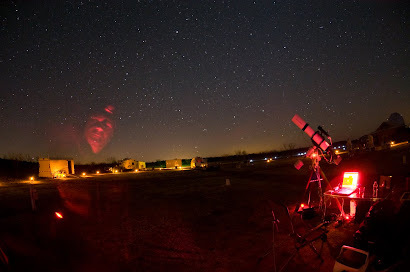 Emission, dark, and reflection nebulae all mingle about in this dusty field. The nebulosity is pretty faint. At just under 3 hours total exposure I really had to dig hard to pull out the data lurking under the noise -- took me 3 days! 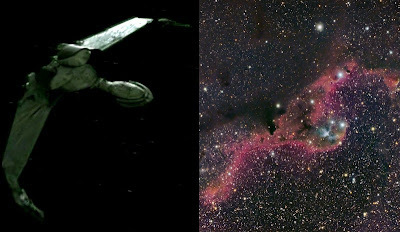 And if you flip the image over, it looks like a Klingon Bird of Prey on fire! 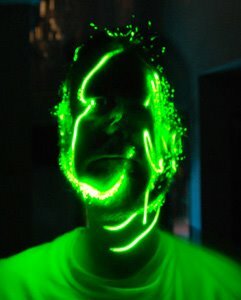 Okay, maybe I stared at this image too long (that, and I am a complete nerd).